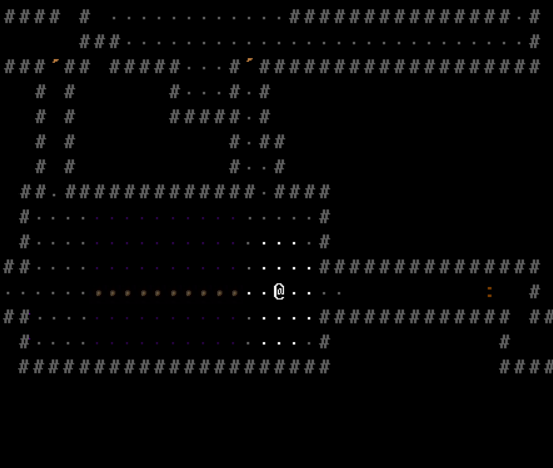 The other terrain addition I think would be fun to implement into Angband is chasms. And bridges over chasms. To avoid such implementation from being annoying, you need to use the W command in order to step into the abyss. That doesn't mean chasms aren't dangerous, though. It's still very possible to unintentionally fall into the abyss. If you are confused, blind or hallucinating and stumble off the edge, you will not be prompted to step off the edge; you simply will fall off. If you are hit by force while near a chasm edge, then you will be blown off the edge and fall into the abyss! They'd add very appropriate atmosphere to the dungeon and would be another step in its continued direction of breaking up the dominant theme of hallway connected by room. Certain scary monsters can rise up out of the abyss and suddenly appear to pursue and attack the player (Balrogs and bats come to mind; not sure if they would be detectable while deep within the chasm. Perhaps not, but to compensate Balrogs can only attack when on terra firm (or a bridge) but not while ascending out of the chasm. If you haven't yet killed the Barlog of Moria, whenever you come to a chasm with a bridge going across it you might be on the lookout for him. Small chasms (without bridges) would start appearing at 1250' +/- 150'. Who knows what other dangers lurk in the depths beneath chasm bridges...? chasms make feather falling a useful thing. thematically, chasms are a logical shoe-in for a game that directly descended from Moria. If you happen to "enter" the abyss, you may die, depending on the size of the chasm and your character level. For a smaller chasm, you will survive if you are CL25 or higher. But you will not be unscathed. You will fall through three dungeon levels and lose 55hp and will briefly be stunned upon landing and entering the new level. If it's a larger chasm (one with a bridge over it) you need to be CL40 or higher to survive it (or have feather falling). If the former is the case, instead of dying you fall through darkness and lose 90 hp upon arriving 5 dungeon levels down, and enter the level stunned. If you have feather falling you simply deep descend as if you had read a ?DD. There is a 30% chance there is a pool of water at the bottom of a chasm. You fall into the abyss! You fall into a chasm! You crash into a pool of water. You are stunned. You alight upon a pool of water. Using ascii to clearly denote where a chasm is might be a bit tricky. Maybe use dark purple dots instead of gray ones where the chasm is? And maybe brown commas (food character) for the bridge squares. Chasms would be kind of the opposite of passable rubble - blocks movement but not LOS. Would need to add AI to avoid monsters stupidly standing around while the player sits on the other side and shoots them (but a bridge across would allow them through). Would chasms function as trap doors? what about items dropped/thrown onto them? Rooms could be made full of a terrain (lava, water, chasms, etc) but with a plain floor border around the edge, allowing the player (and monsters) a path around if they don't want to go through it, but allow accepting the risk / penalties if you want to take a shortcut. I hadn't even considered what happens to arrows and objects shot/thrown at chasm. I guess they go bye, bye! I gave a detailed description of how they could behave sort of like trap doors, but trap doors that have the potential to kill @. Basically if you intentionally step into the chasm, you'll fall through the dungeon and end up 3 or 5 levels down (if you survive the fall). You could unintentionally be thrown into the chasm by force breathed at you by gravity or impact hounds or by the Minotaur lord. You can unintentionally step into the chasm if you are blinded or confused or hallucinating. You could have lava pouring into a chasm on one side and a waterfall pouring into the chasm on other side and a bridge passing down the middle of the chasm with views of the elemental flows on either side. Chasms - or more generally empty space that the player falls through - exist in FA too (maybe Sil stole it from there ). I quite like the idea of having them in Angband, but it would have to be carefully managed. I love it, as long as @ doesn't end up atop a spire with no way to get off except quit the game, like my last guy in FA. Well serves you right for not listening to master Gamgee. You should have brought rope. The spire had a ring of rock wall atop its edges, @ inside the ring, and the main valley was too far away to phase door and had no scrolls of recall. But, in effect, @ did jump... to his suicidal death! I like the Chasm idea a lot, but I have a couple of concerns. The first one, that they should be fun and not annoying, Grotug partially addresses. However, in this respect I am not just concerned about the possibility of YASD, but also of finding a chasm with no bridge cutting @ off from somewhere the player wishes to go. I do not like the idea of a leaping mechanic, because of my second concern, that things should stay Vanilla. I would not want a new mode of movement added to the game. I also would not want Sil-style leaping because I, for one, do not fancy turns where I can move but have no ability to fight or do anything else (I think that is how leaping works in Sil?). Perhaps if chasms only appeared in rooms and vaults of a set shape, so that they could always be crossed without teleportation, that would be alright. Although there is something to be said for an entire level divided by a great, bridgeless chasm which @ can only cross by teleportation; it would have to be deep enough to ensure that by the time @ gets there he is pretty much assured of having teleportation, though. I agree. I am all for the extra atmosphere. This is my favourite thing about the chasm suggestion. It would be great to have them as a place for monsters to come out from. I don't think they should be detectable while they are in the chasm, as in my opinion they ought not to exist until they are out or coming out of it. I think that chasms should be spawning locations for certain monsters. I am not quite satisfied with monsters just appearing out of thin air in random rooms or hallways that @ does not happen to be in; I think it would be much better if ants, bats, centipedes, demons, nagas, spiders, and maybe snakes came out of chasms (maybe only deep chasms for the demons), ogres, hominids, Kobolds (if they stick around), men, Orcs, maybe skeletons, and just maybe more nagas came out of trap doors (Don't you open that trap door! ), water elementals, water vortices, beholders, icky things, jellies, frogs, snakes, water trolls, and any new water monsters spawn in the water, anything can spawn from stairs, and ghosts and perhaps wraiths can still spawn out of thin air. It would be more believable, and would still fulfil the function of random spawning by preventing levels from emptying out and keeping up the danger. On the other hand, I have a hunch that similar ideas have already been thoroughly talked over on the forum before. No complaints. I would give more attention to feather falling if I knew that I might be knocked down a five-level fall. If you happen to "enter" the abyss, you may die, depending on the size of the chasm and your character level. For a smaller chasm, you will survive if you are CL25 or higher. But you will not be unscathed. You will fall through three dungeon levels and lose 55hp and will briefly be stunned upon landing and entering the new level. If it's a larger chasm (one with a bridge over it) you need to be CL40 or higher to survive it (or have feather falling). If the former is the case, instead of dying you fall through darkness and lose 90 hp upon arriving 5 dungeon levels down, and enter the level stunned. I don't agree with fall survival being dependant on character level. Why should it be? I think it should depend on hitpoints alone; those who have the necessary number of hitpoints survive, and those who do not, don't. I suppose that would mean that a level 10 warrior might survive a deep chasm, while a level 40 wizard who has grossly neglected his constitution (or anyone who is already injured) could die. If you have feather falling you simply deep descend as if you had read a ?DD. This seems right enough. It makes for a very elegant, swashbuckling rogue kind of exit, and would likely grow beloved of power divers. There is a 30% chance there is a pool of water at the bottom of a chasm. It seems un-Vanilla for something in the level above to determine anything about the geography of the level below. Let there be connected stairs, but let that be the limit. You could fall anywhere. Anyway, I think reality would suggest that if you are stunned in the water, you die. Even if it is shallow water, if you fall in, and so are not standing up when you get there, I think you would die. I am not advocating for a stunned in the water mechanic, but I don't want to call attention to its absence with a tendency to frequently create the situation. I think that stone bridges should be the norm. Angband is an underground fortress, with tundra or ice sheet on one side and steppe on the other; there isn't going to be a lot of wood around. Accordingly, I think that bridges should look just like normal floor. The only reason I can think of why it might not look like one is if it could be destroyed. Would there be ways for @ or monsters to destroy a bridge? Or maybe for earthquake and explosive traps to do it? Of course, an earthquake could reasonably be expected to fill parts of chasm in, perhaps to the degree of making a way across, even. In any case, traps of most kinds would be simply brutal on a bridge, with any that destroy it, along with trap doors being the worst, followed by confusion traps. This sounds like it would be good, especially in a vault. I like the idea of water pouring into a chasm for other places, too. One question; would there be any way of making monsters fall into a chasm? Confusion should work, and destroying bridges, if that is possible, but I wouldn't mind more. For instance, if a chasm runs up to a wall, I like the idea of being able to lure digging monsters right up to the brink, and if they do dig through to the chasm, they should fall in. After all, they are pushing blindly toward it. Or would that be too hard to code? Chasms might also become sites for a new kind of anti-summoning corridor. If it is possible to add floor to a chasm, by an earthquake or by the dry ground spell suggested in the water thread, or something like it, there could then be a place where only one monster could melee you at a time, and which could not be spoiled by diggers, but which does not block line of sight. I don't know whether there are enough monsters that primarily summon melee monsters to make this a worthwhile strategy, but it is a thought. I hope chasms go through.